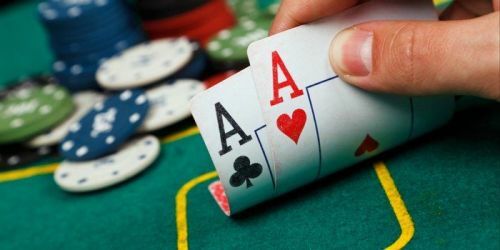 For those who have just started playing poker and want a quick run through of poker hands, here's a quick guide with a list of poker hands and what they mean. What do poker hands mean? This list of poker hand meanings runs from the lowest to the highest ranking 5-card hands. #10 What is High Card hand in poker? For the players who do not make any of the poker hands given below, their highest card is looked at. The cards in a suit are ranked from lowest to highest as 2, 3, 4, 5, 6, 7, 8, 9, 10, J, Q, K, A. If neither you nor your opponent has any of the following hands, then your highest cards are compared. If your highest card is better than the opponent's highest card, then you win. If your highest cards are similar, your second highest cards are compared, and so on. The odds of getting these cards are almost 2:1. #9 What is ONE PAIR in poker? If you have two cards of the same rank in your 5-card hand, then you have a pair. You can get this hand 1 out of 1.37 times, which mean you can easily get this hand. #8 What are TWO PAIRS in poker? As the name suggests, having two pairs is better than having one pair. When out of your five cards, you have two pairs of similar-ranking cards, then you have two pairs. You can get this card one out of 20 times. #7 What is THREE OF A KIND in poker? Next comes three of a kind. In this hand of five cards, you have three cards with the same rank, while the other two cards are not of the same rank. You can get this card one out of 46.3 times. #6 What is STRAIGHT in poker? At number 6 position is a hand called Straight. This has 5 consecutively ranking cards of not the same suit. You can get this hand one out of 254 times. #5 What is FLUSH in poker? You have a flush if you have all the cards of the same suit. The cards are not in a sequence. There is only one in 508 chance of you getting a hand like this. #4 What is FULL HOUSE in poker? You have a full house when out of your five cards, three cards are of the same rank and the rest two cards are a pair of the same rank. You can get this card one out of 693 times. #3 What is FOUR OF A KIND in poker? In this hand, out of your five top cards, four cards are of the same rank. You can get this hand only one out of 4,165 times. #2 What is STRAIGHT FLUSH in poker? You have a straight flush when your 5 cards are in sequence and belong to the same suit. You can get this hand one out 72,192 times. #1 What is ROYAL FLUSH in Poker? As the name suggests, the royal flush is the top-most hand. You have a royal flush when you have suited Ace, King, Queen, Jack, and 10. It is extremely difficult to get this hand. There's only one in 649,740 chance of getting this hand. Preflop Meaning | What does Preflop mean in Poker?